Head and neck pain, sore or clicking jaw, it could be TMJ Disorder? Jaw joint (TMJ) disorder is a complex issue encompassing a wide range of symptoms and an equally wide range of treatment philosophies. The Myosa® for TMJ Disorder range of myofunctional appliances has been designed with the purpose of assisting with immediate diagnosis and symptom relief right from the first consultation with your doctor. 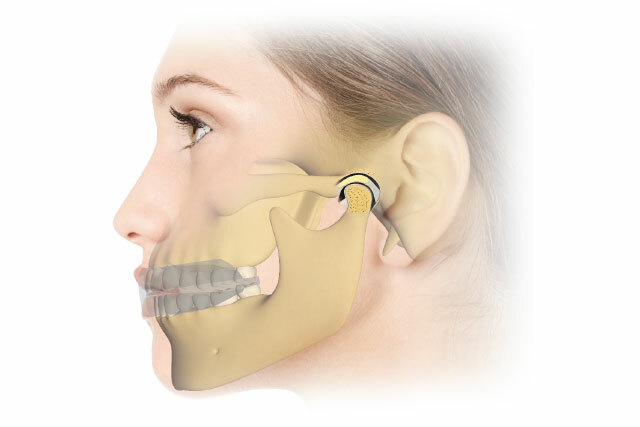 Because jaw joint (TMJ) disorder involves the teeth, facial muscles and jaw joints interacting to produce a wide range of symptoms, the Myosa® for TMJ Disorder range works by decompressing the jaw joint (TMJ) and moving the lower jaw into the correct position as well as limiting bruxing, mouth breathing and incorrect myofunctional habits. To determine whether you may have TMJ Disorder download our Self Evaluation. The Myosa® TMJ appliance is specifically designed to act as a universal, initial diagnostic and treatment tool for jaw joint (TMJ) disorder. The appliance, which does not require any special fitting or adjustment, should be used one hour each day and overnight for a minimum of 30 to 60 days. This initial period of wear should enable the patient to determine how much continued use is needed to maintain symptom relief. By assisting to decompress the jaw joint (TMJ), correct mouth breathing and tongue posture as well as limit teeth grinding the Myosa® TMJ alleviates symptoms by relieving pressure on the jaw joints and relaxing muscles around the jaw and neck. 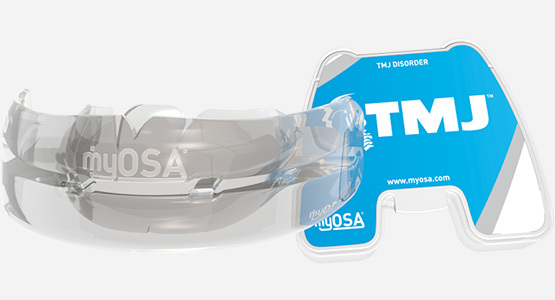 The Myosa® TMD appliance is specifically designed for the diagnosis and treatment of jaw joint (TMJ) Disorder. The appliance, which should be fitted and customised by your doctor to the correct therapeutic bite, has a comfortable low profile allowing for daytime use and unimpeded speech. 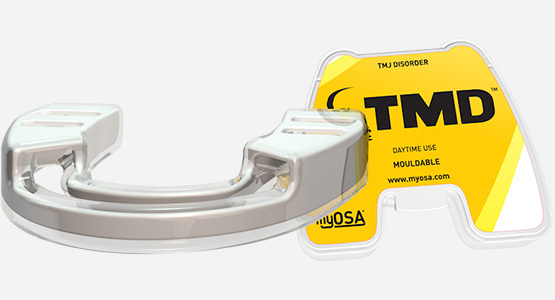 When combined with night time use of the Myosa® TMJ, the Myosa® TMD is suitable for patients experiencing more severe symptoms of jaw joint (TMJ) disorder. While the flexible Myosa® TMJ is ideally suited to night time use, the Myosa® TMD can be used while sleeping provided the fit is secure. The jaw joint (TMJ) is where the lower jaw joins the temporal bone of the skull. Each time a person chews, speaks and swallows the joint moves so therefore it is one of the most frequently used joints in the body. The causes of jaw joint disorder can be multi-faceted and symptoms often stem from dysfunctional interaction between the teeth, facial muscles and jaws. These causes can include tension, misaligned or missing teeth as well as poor dental work, incorrect myofunctional (muscle function) habits including mouth breathing, incorrect jaw development, trauma or degenerative diseases such as osteoarthritis. The jaw joint (TMJ) can be located by pressing the fingertips immediately in front of the ear on each side of the face. By fully opening then closing the mouth, movement in the TMJ can be felt. 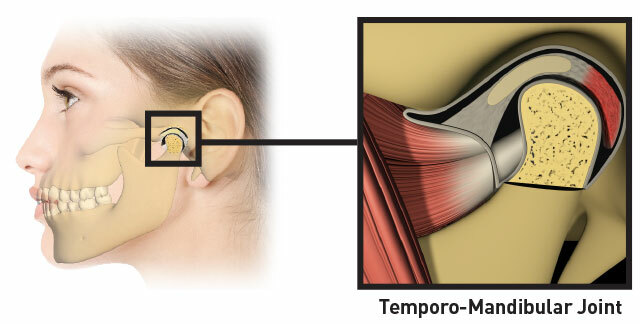 This motion in the TMJ can also be felt by inserting the tips of the little fingers into the ear canal (with fingernail backwards) then pressing forwards while opening and closing the jaw. While this exercise may cause pain for sufferers of TMJ disorder, most symptoms are located away from the TMJ and many undiagnosed sufferers will have experienced chronic head, neck, ear and other pain. Regardless of the cause or severity of a patient’s TMJ the Myosa® for TMJ appliance range covers both intra-capsular and extra-capsular treatment, aimed at relieving pressure on the TMJ, decreasing muscle tension and limiting the effects of jaw clenching. 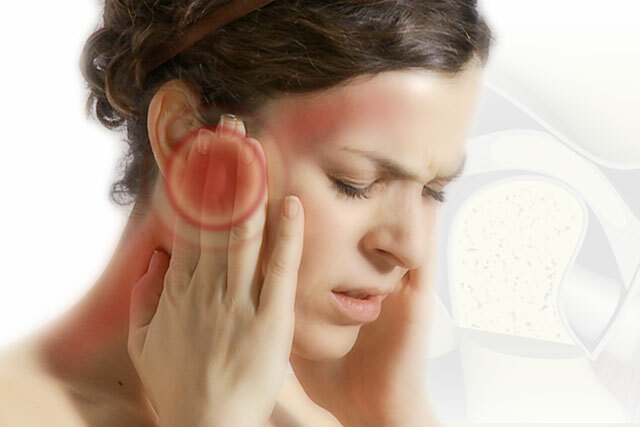 Treatment with the Myosa® range provides immediate relief from the symptoms of TMJ Disorder. The Myosa® for TMJ range is comprised of a series of soft intra-oral appliances specifically designed to assist in the diagnosis and symptom relief of TMJ Disorder. The appliances have a thick section at the back, which when placed in the mouth relieves pressure by gently decompressing the inflamed joints. The Myosa® for TMJ appliances are designed to automatically correct the alignment of the lower jaw as well as stretch tight, painful muscles around the jaws, head and neck. This results in an immediate as well as long term decrease in pain. The Myosa® for TMJ system’s patented aerofoil base and dual moulded design also prevents bruxing.